At Enviro Guard Pest Management, we pride ourselves on our professional commitment to solving your pest problem. You can rest assured that all treatments we offer are carried out professionally and thoroughly, in accordance with the Australian Standards. We offer high-quality, fast, and professional service with a smile. Pest Control Satisfaction – We do not believe in quick fix results! We offer satisfaction insurance against pests such as termites with our onsite termite inspection report. Our highly accredited technicians approach every situation with the skills to solve problems that other pest companies may not. We have the confidence to warranty our work for 12 months* because we use the best products on the market. We guarantee that you will be satisfied with our results using Termidor, Bayer and Agenda products. To learn more about our individual service pricing, click HERE. We value your business, and we take pride in being there when you need us. 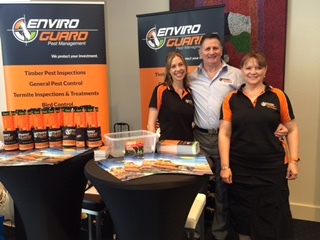 Call Enviro Guard Pest Management today for a free quote on 1300 669 092. You will be glad you did!